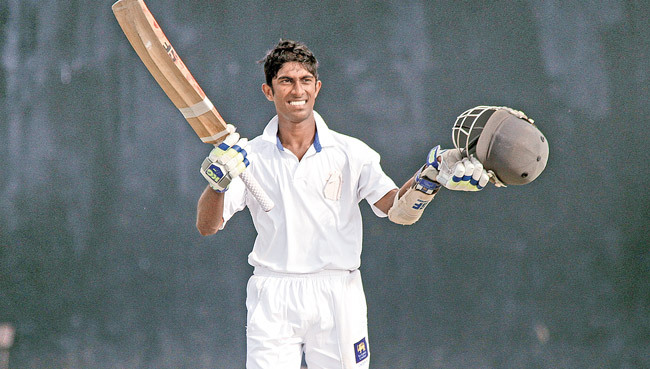 Ramesh Nimantha, a fifth-year coloursman of St.Servatius College, Matara who played a dominant role with the bat for his school to gain ascendancy in this season’s U19 Division One League tournament achieved two landmarks when he became the competition’s leading run-scorer and highest individual scorer (Ramesh’s career-best). This 19-year old highly-accomplished right-hander scored 1108 runs at an average of 55.40 – second best in the list – to top the batting list of U19 D1 league Tournament whilst becoming one of the three players who crossed 1000-run mark in this whole tourney. Ramesh also played the season’s outstanding and the highest individual innings in this competition. His career-best 212 not out against Gurukula at Uyanwatta Stadium was a watchable innings containing 32 fours and 2 sixes from just 204 balls and it was only the second double-hundred in the competition. Ramesh’s 1108 runs that came from 22 innings had 4 centuries (1 double-ton and 3 hundreds) and 7 fifties in it including 129 fours and 8 sixes. Of the three centuries he scored, 143 against Thurstan was a classy one as his astounding effort helped Servatius reach a match-winning 298 recovering from a pathetic position of 28 for four and beat Thurstan on the first innings to clinch a spot in quarter finals of the knock-out round of the League tourney. Ramesh’s 100 not out against Moratu Vidyalaya that he scored off just 83 balls was his fastest hundred.